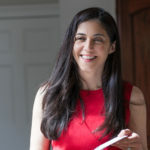 Marjorie Lotfi Gill’s poems have won competitions, been published widely in journals and anthologies (including Ambit, Gutter, Magma, The North, Rattle and The Rialto) and been performed on BBC Radio 4. Her pamphlet Refuge, poems about her childhood in revolutionary Iran, was published by Tapsalteerie Press in 2018. She was commissioned to write Pilgrim, a sequence about migration between Iran and the US, for the St Magnus Festival; and Bridge, a companion sequence about a woman’s migration within Europe, for the University of Edinburgh. Marjorie is one of the first recipients of the Scottish Book Trust’s Ignite Fellowship. She has also been Writer in Residence at Jupiter Artland, Spring Fling and the Wigtown Book Festival. Marjorie founded The Belonging Project, exploring the refugee experience, and is a founder and director of Open Book, a charity reading in community settings across Scotland. She is the Chair of the Wigtown Book Festival. before nodding its head to wind.